School Closed Today Due To Fires! (Update 8:45am) School cancelled tomorrow (Friday) also. No practices for MS or HS today or tomorrow. X-Country will not travel to tomorrow's meet they have been reschedule to attend the Jim Thorpe Invitational in Pine Ridge next Tuesday (9/4). Softball will travel to Saturday tournament as planned, Football will travel to Gering tomorrow as planned. 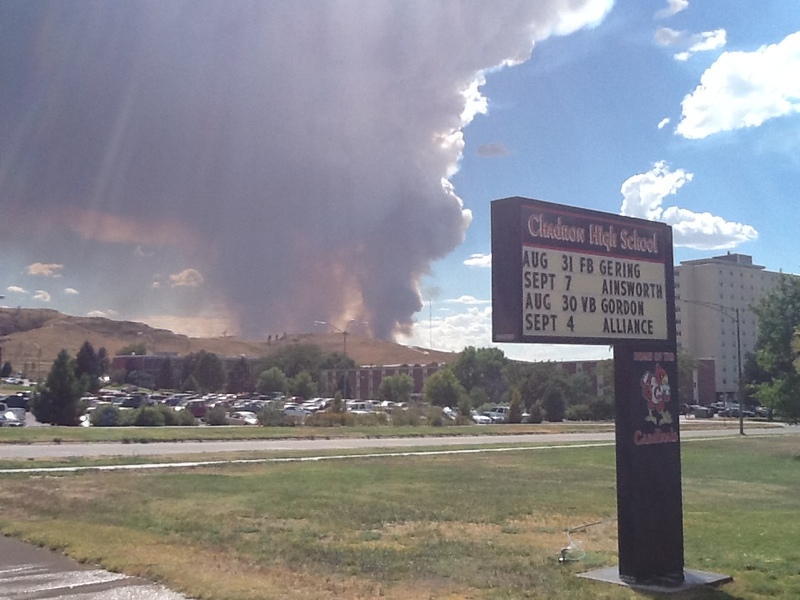 All the Chadron Public Schools are closed today due to the uncertainty of fire behavior. Last night evacuations were ordered for areas within 5 miles South of town, several of our families and staff were evacuated. All activities (practices and games) will not take place today. The volleyball game to be hosted tonight has been postponed to a date not yet determined. We have not made a decision on whether school will be closed tomorrow, stay tuned for updates at our facebook page www.facebook.com/ChadronHighSchool and to local media for further announcements. We thank the firefighters and many community volunteers that are offering assistance in these uncertain conditions. Stay safe firefighters! Thank you for all you do!! Take college courses while still enrolled in high school. Access high quality, low cost college classes associated with a variety of majors and general studies at Chadron State College. Pay a low flat rate of $50 per credit hour or $150 per three credit course. There is a one-time $15 matriculation fee. State scholarships are available for low-income students. Interact with CSC professors online or face-to-face. Accelerate degree completion with credits earned while still living at home and enrolled in high school. Participate fully your junior and senior year of high school and save up to $7,000 on the cost of a bachelor's degree with the possibility of completing your degree in just three more years. All credits are generally transferable to other colleges and universities. For this first year, Chadron High School is offering six classes as dual-enrollment. CHS AP Literature counts as CSC ENG 160 for 3 credits. CHS Personal Finance counts as CSC FIN 239 for 3 credits. CHS AP US History (year-long course) counts as CSC HIST 231 and HIST 232 for 6 credits. CHS Pre-Calculus counts as CSC MATH 142 for 4 credits. CHS AP Calculus counts as CSC MATH 138 for 3 credits. CHS AP Statistics counts as CSC MATH 232 for 3 credits. In addition to this new ACES program with Chadron State College, we continue to offer dual enrollment opportunities with WNCC with our Medical Terminology and Basic Nursing classes. We also allow students to pay full price to take CSC classes on their campus. 35 of our students are currently enrolled in at least one of these college credit opportunities. CHS State Test Scores Arrive! 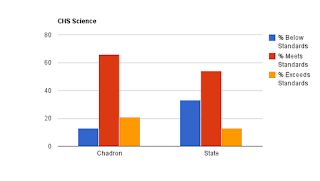 The recent release of Chadron Public School’s 2012 Nebraska State Assessment (NeSA) Reading, Math, and Science report on student results proved very exciting! Statewide tests were administered earlier last spring in grades 3 through 8 and at the 11th grade. The tests measure Nebraska state standards. These scores are part of state and federal calculations used in determining Annual Yearly Progress (AYP). Parents will receive a report on their child’s scores after August 21. 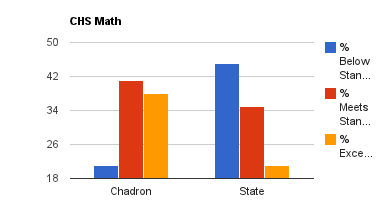 As a district, Chadron Public Schools performed exceptionally well and numerous grade levels performed greater than the state average. Our students and staff should be celebrated! Positive outcomes can only be attained when everyone is working together. Every CPS staff member is a reading teacher, allowing all other content areas to be enhanced. Our student performance data speaks for itself as we continue to progress. Students, staff, and all other stakeholders should be very proud of what we are accomplishing at Chadron Public Schools; celebrations are being scheduled to acknowledge their efforts. We still, however, have challenges. Our goal is to turn these challenges into successes. Test results provide another effective tool to improve instruction for every child, but no single test score can tell the full story about the performance of an individual student or a school building or district. The CPS focus will remain on growth and gain for all students. The staff will continue to align grade level and content area curriculum, analyze data, reflect, and determine a course of action continuing to narrow our achievement gaps. Chadron Schools are extremely proud of our accomplishments (given changes to Rural, Elementary and Middle Schools consolidating and reconfiguring by grade level, staff and student reassignments prior to the 2011-12 school year) as should students, parents, grandparents, and community members. In closing, we can’t thank our students enough. Huge accolades go to our student body. Students stepped up and applied the learning. They demonstrated what Chadron Public Schools does best- preparing for the future. 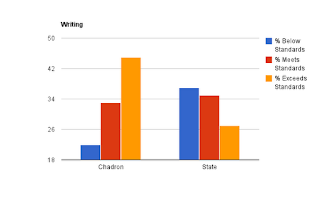 Here are the results our our high school juniors that tested last spring. Exceeds Standards: CHS 54%, State 25% ...wow!!! we had 6 perfect scores! Exceeds Standards: CHS 38%, State 21% ...we had 5 perfect scores! 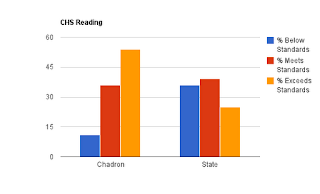 Meets the Standards: CHS 66%, State 54% ...the first year this was tested ... very pleased! Exceeds Standards: CHS 21%, State 13% ...1 perfect score! Overall, you can see why we are so excited at the academic successes we are maintaing at Chadron High School. I have looked at the data from other schools in the State to compare our scores, and I can report that I am very pleased to see Chadron High School lead the charge in educating students. Our successes did not happen overnight. We have spent many years in meeting and mapping curriculum as a K-12 system. Our school goals are reading and writing, we emphasize that every teacher in our school teaches reading and writing, with this foundation we build comprehension in other subject areas. 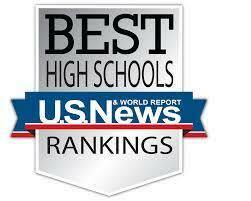 Thank you to our students and staff for all the work every day that is required to maintain this excellence! 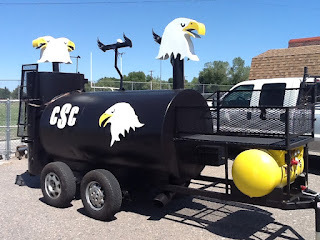 New CSC grill built by the CHS Welding class. 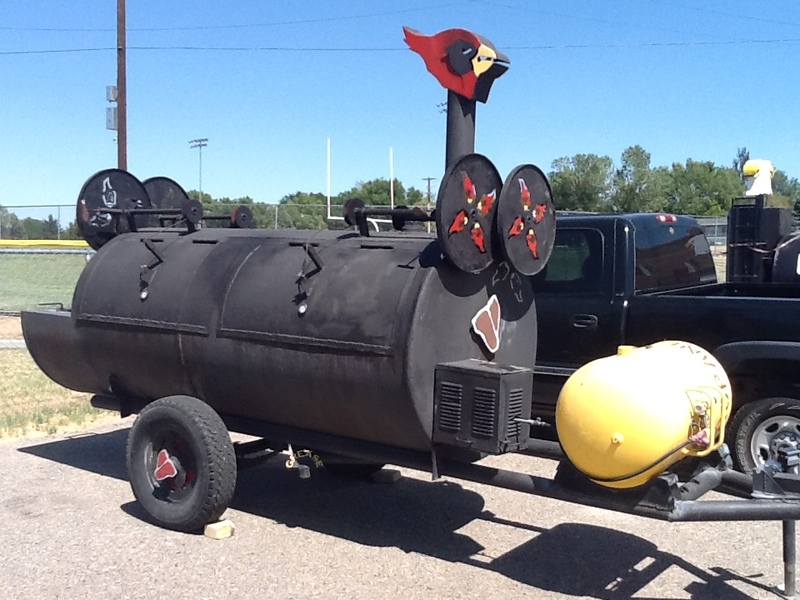 Check out the near-finished project that the CHS Welding students worked on last spring! CHS teacher, Jon Cogdill, took on a project for building a large grill for tail-gates and barbecues for Chadron State College. Our students designed a built this grill during class last semester. The grill was then hauled to Pine Ridge Job Corps for painting this summer. It just returned so finishing touches can be made and .... grilling can begin! Original Cardinal grill built by the CHS Welding class. The new CSC grill has several improvements from the original Cardinal Grill built two years ago. The new grill has folding work tables on three sides and a seven-rack smoker built on the back. These projects allow students to not only take pride in designing and building community projects but better simulate the business of manufacturing and working with customers. The success of these projects has already lead to more orders ... including grills. Just a quick update on a few events that will take place during the next week. Tuesday (8/21): High School Open House, 6:00 - 7:30 (Bring your student and come tour the school and visit with teachers, refreshments will be available.) Yearbooks will be available to be picked up for the first time during the Open House! Friday (8/24): Home Football versus Alliance, 7:00 School dance will follow sponsored by the Europe Travel Club. Meeting Tuesday Open to Community! Community meeting Tuesday featuring an overview of Sparks (how to have meaningful conversations with young people to "spark" their interest). The meeting is open to everyone that works with young people including parents, grandparents, 4-H leaders, church youth leaders, boy & girl scouts, etc. It will be at 7 PM Tuesday night, August 14, in the High School Auditorium. When and where do you live your spark? Who helps feed your spark? How will you use your spark to make our world better? 31% of teenagers understand the concept but don’t think they have a spark. We have received official notice that Chadron High School was selected as a 2012 College Access Grant recipient sponsored by the EucationQuest Foundation. Carolyn Hinrichs, our CHS Student Liaison, wrote and submitted this grant last spring in hopes of increasing our high school's college-going rate. We will be awarded $20,000 to be used during the next four years. On behalf of our school district, I want to thank Mrs. Hinrichs for the training and hard work that she put in to this award for our school! The grant is called the EducationQuest College Access Grant and provides funding to Nebraska high schools that seek to increase their college-going rate. High schools are funded for four years with a goal to increase their college-going rate by 10 percentage points. We received a $20,000 award ($5,000 for each of the next four years). They are awarded every two years through a competitive application process and we got one! We had to pick a “target” audience……I chose our Free/Reduced kids because I feel like they probably need the most support to get to college. We can include other students as room/funding permits. Take all sophomores up to CSC. We will have brunch or breakfast, tour the dorms and have a faculty member discuss the benefits of continuing education. Develop community partnerships. I’d like to start a formalized speaker series where students can eat lunch while listening to a community member. Continue field trips. For example, we already take a trip to WNCC in Scottsbluff to visit their campus. On the way down, we stop at Alliance to visit the Powerline Program. If we have interest, I’d like to add a trip to Sidney for kids who are interested in Airframe Maintenance and Cosmetology. Continue our safety net, using Western Community Health Resources for students with additional challenges. 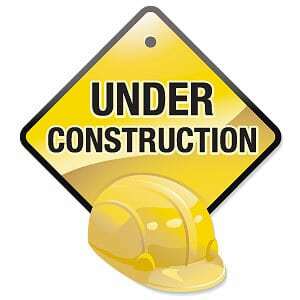 Many of the things that are required are already in place – thank goodness!!!! All K-12 parents are encouraged to register for the Campus Portal to have access to Infinite Campus. To register, stop at the office of the school where at least one of your children attend or, simply stop at the high school office where the district registrar, Tricia Berry, can provide you with the necessary form. Parents must bring a photo I.D. to register! After surveying senior parents this summer, the results show great support to move graduation to Saturday, May 11th @ 10:00am. Recommendation was made by a parent group last spring to see if we would consider moving graduation which has typically been held on the Sunday of Mother's Day. Parents suggested that moving the ceremony up one day would benefit those that travel by allowing them to spend more time after the ceremony celebrating with family and friends. Other benefits of the change would be gaining a day of rest before returning to work or school, especially to have the opportunity to show appreciation and celebrate Mother's Day. Thank you to all who responded to the survey! "Opinion to change graduation from Sunday (May 12th) to Saturday (May 11th)"
"In order to not conflict with other area graduations at 2pm, would you prefer...."
School Website ... Temporarily Down! Our district has created a new website under the direction of our Technology Department. The template has been submitted and the new design will be available during the first week of school. Access to the school calendar and a few other links are still available.